"I do not form shapes, I collect shapes to create my forms." 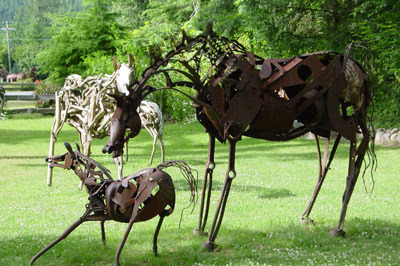 Welcome to a web page devoted to my love of iron sculpture! Please come and visit my sculpture park titled Ex-Nihilo (pronounced "Ex Nee-Hill-o" - one of several ways to pronounce it according to Webster's!) which means something created from out of nothing in Latin. Ex-Nihilo is located right alongside State Route 706 on the way to the west entrance to Mount Rainier National Park in beautiful Washington State.